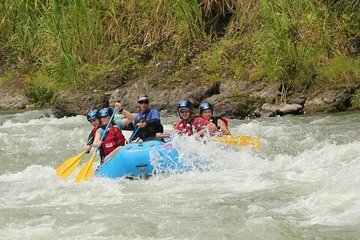 Ideal for first-time rafters, this 8-hour white-water rafting experience on the Pacuare River provides a perfect introduction to the adventurous activity. Under the guidance of an expert instructor, you’ll paddle on Class II and III rapids while absorbing rainforest scenery. Enjoy a gourmet lunch and celebrate your journey with a cocktail and an off-road ride in a 4x4. Hotel pickup and drop-off in San Jose are included. Rise early and await pickup from your San Jose hotel at 5:30am, when you’ll board a vehicle destined for the upper reaches of the Pacuare River. Before a comprehensive safety briefing, you’ll enjoy a typical Costa Rican breakfast and don your protective gear. Once you feel ready, board your inflatable raft and begin your journey down the river. Navigate Class II and III rapids and enjoy scenic jungle scenery as you paddle. Depending on the water levels, you’ll disembark your raft to hike through the jungle, swim in the river, and revitalize with a gourmet lunch prepared by your guide. Your tour culminates with a celebratory cocktail and an off-road ride in a 4x4 vehicle before concluding with drop-off at your San Jose hotel.